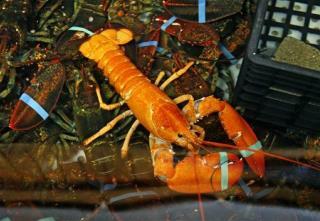 (Newser) – State health inspectors are investigating a Maine lobster restaurant that tried to mellow out lobsters with marijuana, the AP reports. The Portland Press Herald reports Charlotte's Legendary Lobster Pound in Southwest Harbor remains open but has stopped allowing customers to request meat from lobsters sedated with marijuana. Owner Charlotte Gill is a state-licensed medical marijuana caregiver. How to score free advertising 101! We were at a party His earlobe fell in the deep Someone reached in and grabbed it It was a rock lobster Rock lobster Rock lobster. She sounds like a stereotyped burner. This sounds like a scene you'd expect to see in a Seth Rogan movie, or something Jay and Silent Bob would be doing. Ease up a bit lady. You're loosing it.